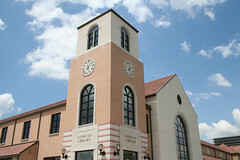 A friend of mine took this photo of the new Looscan Neighborhood Library shortly before the grand opening. I posted about this facility recently, since it’s the first green library in our system. I like the sky in the background, it almost looks fake.